This friendly, comfortable Maine cottage with knotty pine paneling has been recently tastefully and carefully updated. Well insulated, new windows, kitchen, foundation, completed 2014. We rent Saturday to Saturday in the summer. Several weeks have opened up this summer as one of our long time guests has bought a condo in York, as we wouldn't sell our cottage to them! Winter 2019/2020 available Sept 15th to may 15th. Call or email for rates! We accept dogs on a limited basis. Please contact us! 2 bedrooms, one with Queen bed, closet and air conditioner, the second bedroom has 2 twin beds on the porch. Kitchen has Refrigerator/Freezer, Stove/Oven, and eat in Dining area. We have a full sized washer and dryer. Bathroom with Tub/shower. Living room with 2 couches, cable TV and sky light and air conditioner. Combination locks on the doors, no keys to lose! Outside there are 2 parking places, outdoor chairs and table. Sit outside and enjoy the quiet family neighborhood. The cottage is a 'stone's throw' to a rocky beach for tide pooling, swimming at high tide, star gazing, and views of Shorts Sands Beach! Hear the waves from the cottage! A short walk the other way is another small tidal beach in the bay, scramble over the rocks to get there. Popular Short Sands Beach is a pleasant 1/2 mile walk on a tree-lined side street. Shops, restaurants (including great local seafood). You'll find York's Wild Kingdom, The Goldenrod (world famous for salt water taffy made the same way 100 years), Funarama with games including skee ball, a wonderful beach side playground and the Gazebo for summer concerts. Walk on another 20 minutes to Dunne's ice cream and on to the Nubble Lighthouse, enjoying the rocky Maine coastline, and fabulous ocean views. Long Sands beach is another little walk or drive away. Short drives open a world of sightseeing, shopping, hiking, boating, etc. Portland is 30 minutes away with ferries to the Maine islands; driving up or down the coast leads you to outlet shopping at Freeport, one hour away, or Kittery, 15 minutes away; a burst of driving to the heart of the New Hampshire White Mountains for a days junket is one and one-half hours away. Please leave the cottage as your found it when you leave, a cleaning fee is not included. Please supply your own linens, towels, beach towels. We come to the cottage in between every guest, to make sure every thing is ready for your arrival. The cottage has been in our family for 40 years, we love it and hope you will love it too and return year after year like some of our guests do!! Please note, we accept pets on an individual basis. If you have allergies to pets, please find other accommodations. Gary's family picked family oriented York for their vacation spot from their home in Keene. I'm Gary's wife, Marion, I'm from Bermuda, and a flight attendant. I love the cottage as our whole family does! We find York so interesting and has kept the old fashioned family oriented way, it is fascinating and charming. A great place to vacation year after year. We love it there. We just live 30 minutes away. Family friendly, close to beaches. Several miles from Highway, easy to find. York is a year round town, there are reasons to come here any time of the year! The beaches, antiquing, proximity to Portland, Boston, mountains, ocean, etc! This family friendly area, suitable for all ages. The beach, town, playground. Areas to explore, the White Mountains a few hours beautiful drive away. Shopping outlets in Kittery and Freeport. The Maine coast with spectacular scenery. Fall Foliage and the coast line are a wonderful combination for the walker, painter, photographer, or just want to see what it's all about! 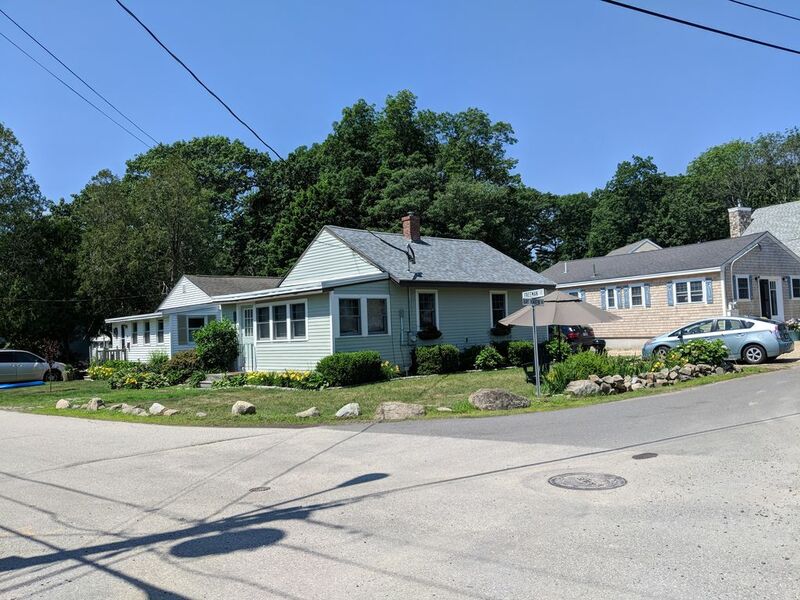 York Beach village is a short half mile walk down a lovely quiet tree lined street, on your way seeing other rental properties, and an expansive view of Short Sands Beach as you approach the village. From the cottage you can glimpse a view of the Atlantic Ocean over the small road that leads to a lovely rocky beach. One located in main bedroom, and one in living room. 2 parking spaces, one outside kitchen and one outside front door. TV in Living Room. Has NESN, and closed captioning. Queen Bedroom with TV. Secure internet! There is a DVD Player and several DVDs. Beach Umbrella, 4 beach chairs. This is the 5th year we have rented this Cottage and it’s always a wonderful experience! Thank you for your wonderful comments about your stay at Memories cottage! We have been renting for a number of years and plan to continue for many more! Nice week at nice cottage. This is a very nice little cottage in a good location in York. We will be back. We have been renting here for 5 years and plan on returning next summer. The location is perfect and the owners superb! Thank you so much for taking the time to write a review! We love our faithful guests! Beautiful cottage. Great location,quiet neighborhood. Close to Rocky beacb. Maryclare and KIm Thomas P.
We love staying at the cottage. Plenty of room.Comfortabe and cozy. Thank you for coming to stay at Memories Cottage again this year. We hope it will be for many years to come! We appreciate you! We stayed here for one week and I think is was great. It had everything you would need for a stay. It is close to everything, walking within minutes to the beaches or a very short drive to everything else. Just a great place to stay. Two large sandy beaches near by, Short Sands, half mile and Long Sands, one mile. Tide pooling at the Rocky Beach just across the road and down a small road. Antiquing abounds from Route One in York, all the way along Route One through Ogunquit, Wells and Kennebunkport. York's Wild Kingdom is in York Beach village about half mile from the cottage. York village has the old fashioned and fun arcade for hours of enjoyment. The historic Golden Rod restaurant and candy shop, where you can watch them making salt water taffy. Nubble Light is a good walk away, or drive and enjoy ice creams up by there at Fox's or Dunne's. Various festivals during the year in York Beach Village. Kittery Outlet Shops, just a 10 minute drive down Route One. Starting 2017, we are preferring our guests pay by credit card through VRBO.com. Cleaning fee is not included, please leave cottage ready for the next set of guests, as you found it. Please bring linens for the beds and all towels needed for your stay.